Marvelous Answers for Marvelous Questions! 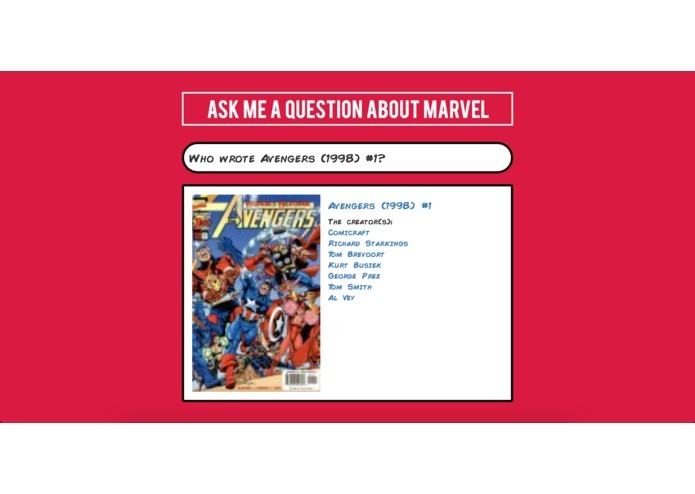 Ask about the many iconic Marvel Superheroes and Supervillains! Find new comics containing your favorite characters! Learn more about new AND old comics! Get information on legendary Marvel events! Have you ever felt overwhelmed by the vast universe that is Marvel Comics? 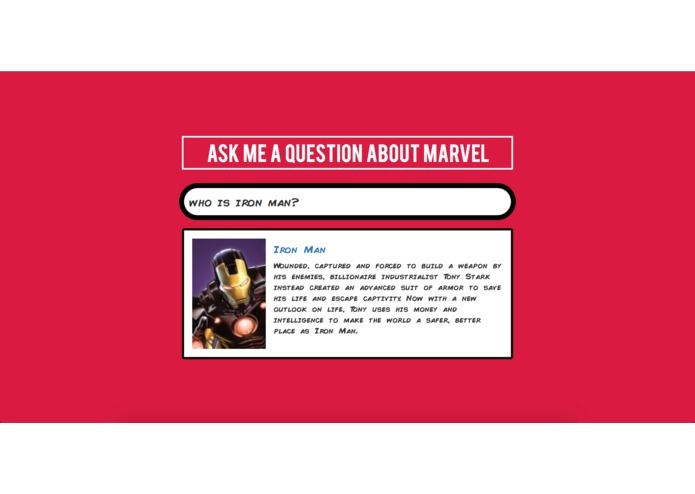 Did you ever have a burning question about one of your favorite Superheroes? Not sure what comics to read next? Or, was there ever that superhero you've heard the name of, but know nothing about? Then, ask us one of your marvelous questions! 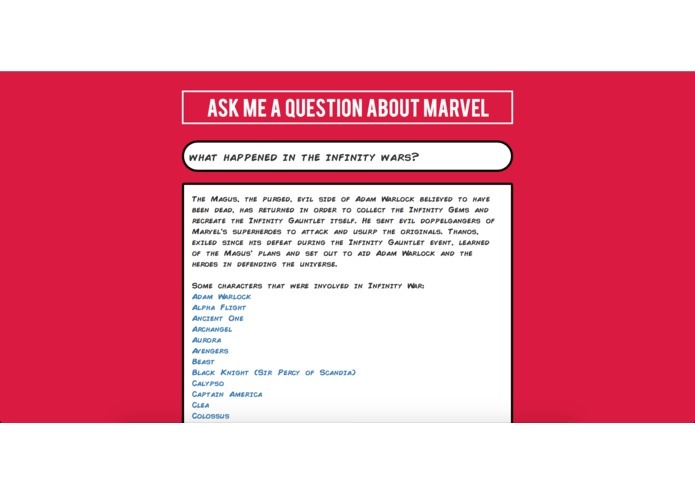 Ask our platform questions in plain English and watch as it understands your question and uses the robust Marvel API to find the answer you're looking for! 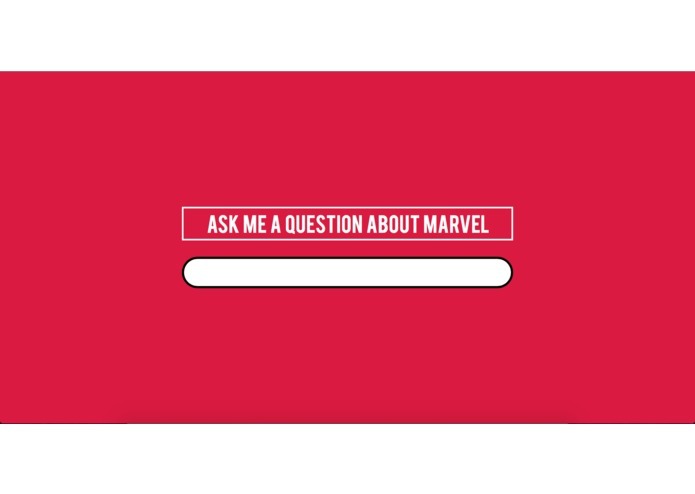 It will answer any question that the Marvel API has information about. We utilized a NodeJS backend using the Microsoft Language Understanding Intelligent Service(LUIS) and the Marvel API to help understand and answer your questions. We trained the LUIS with almost 400 different test inputs which we then categorized so it can intelligently predict the categorization of other phrases. 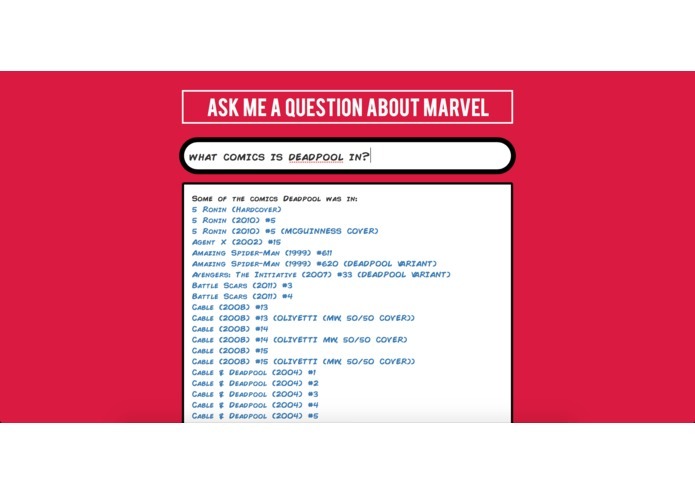 The Marvel API had some limitations which required some creative solutions and algorithms in order to efficiently and effectively search the large database of characters, events, and comics. The Language Understanding Intelligent Service had to be trained extensively in order to allow our platform to understand a wide variety of wordings and question types. We hope that our platform will open the knowledge contained in the Marvel API to both seasoned and newbie Marvel enthusiasts. We strove to achieve ease of use without limiting the scope of accessible knowledge. We designed the page to be simple yet full of information with a familiar feel for comic book fans. The next step would be to continue to improve Marvelous Questions' ability to interpret and answer your questions and to expand the range of answerable questions by harnessing new resources across the Internet. I worked on the frontend and the backend. I also helped train the AI. I helped design the UI, worked on the Marvel API search algorithm, and helped train the AI.